Born April 12, 1919 in Douglasville, GA to Mark & Celestia DeVaughn Page. He enlisted in the U.S. Navy (serving in the Coast Guard) during World War II and later was a 20 year member of the U.S. Coast Guard Auxiliary, (2nd Coast Guard District). After an Honorable Discharge from the military he began working at General Motors Corporation (Frigidaire & Delco Air Dvision) During that time he also earned a Certificate from Commercial Trades Institute as an Automatic Transmission Specialist and Owned & Operated Page’s Garage for over 20 years. He retired from GMC in December of 1978 after more than 30 years of employment..
For over 35 yrs & as long as his health permitted, was an active member, of The Church of Jesus, Springfield, Ohio under the leadership of the late Bishop Cecil A. Pratt, Jr. He was a “Strong Silent Man” with a heart of gold, a Master Gardener who for many years donated fresh vegetables to Second Harvest, was recognized by Community Hospital for his volunteer efforts during the Blizzard of 1978, & was a search & rescue volunteer during the devastation of the 1974 Xenia Tornado. 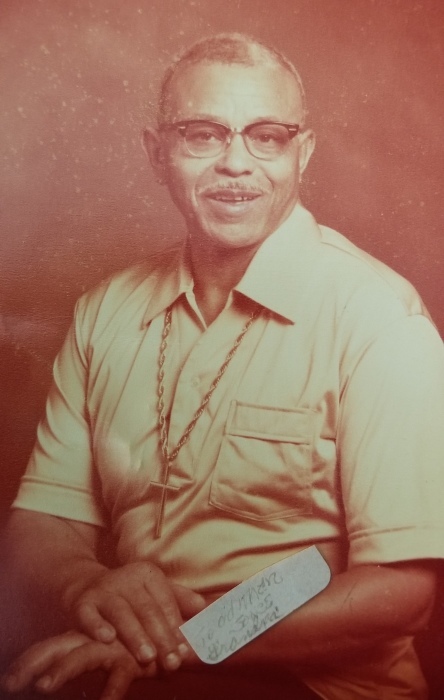 Cherishing memories of our Strong Silent Patriarch are, Sisters, Lavola Starr, Atlanta, GA & Louise McNair, Charlotte, NC; daughter & son-in-law, Ramona (Ernest) Henry (with whom he resided); son, Claude (Domina) Page Jr., Dayton, OH; grandchildren, Sandra Page, M. Brandon (Ellen) Jones, Patrice Page and Claude Page III, 6 step-grandchildren, 8 great grandchildren and a host of nieces, nephews and other relatives & friends. God alloed him to make a peaceful transition from this earth on March 22, 2019. Preceded in death by his parents; two wives, Frankie Page & Australia M. Page; siblings, Larsena, Lorean, Lessie Mae & Noah.